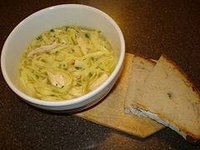 If you are ill, cold or just have a desire for soup, chicken noodle soup is a common comfort food. Some recipes call for packaged egg noddles or spaghetti noodles, but nothing really says "comfort food" quite like homemade noodles. Astound your family and friends by making these quick and easy home made noodles to add to your next pot of chicken noodle soup. Beat eggs. In a medium size bowl, beat the eggs using a fork or whisk. Slowly add the cream and salt. Add flour. Add the flour to the egg mixture, slowly work in a little at a time. Blend with a fork or pastry cutter. Divide. On a floured surface, divide the dough into two balls. Using a floured rolling pin, roll each ball out on the floured surface until the dough is very thin. Slice dough into strips and then cut the strips into 2-inch pieces. Place the dough strips on wax paper. Allow the dough to dry at room temperature for 30 minutes. Add noodles to the chicken broth and bring it to a boil for 5 minutes. Extra noodles can be frozen following the drying process. Simply place them in single layers between sheets of wax paper. Freeze in a freezer bag or air tight container. Homemade noodles are not dried like the packaged type and quickly become mushy. Avoid letting them boil or soak too long in the broth. Can You Make Egg Noodles With Self Rising Flour?